Europe has the Euros, Africa has their Cup of Nations, and Asia has this: the Asian Cup. For an Asian footballing power such as Korea, such a side could reasonably expect to associate itself with continental success. And yet, somehow, for some reason, this tournament has been anything but successful for the Taeguk Warriors. After winning the first two editions in 1956 in Hong Kong and at home in 1960, the Taeguk Warriors have been unable to lay their hands on the Asian Cup trophy. This tournament has thrown Korea too many nasty surprises and frustrating failures. Indeed, there is a ghost looming somewhere in these Emirati stadiums reminding Korean players and fans alike of this inevitable truth. Al-Maktoum Stadium, Dubai, December 16th, 1996 – a day that will live in Korean football infamy. 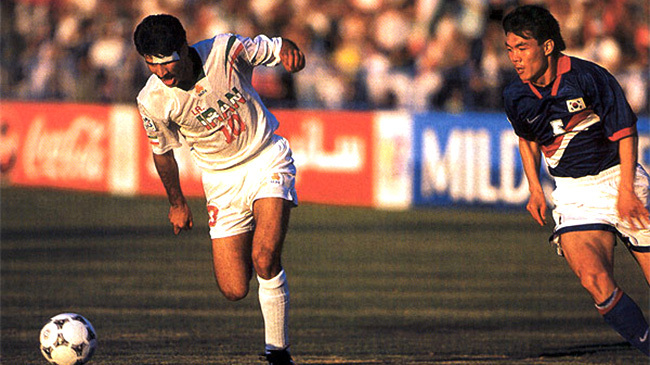 After Shin Tae-yong scored in the 35th minute to restore Korea’s 2-1 lead over Iran in the quarter-final, the Iranians surged with 5 unanswered goals – including 4 from legend and captain Ali Daei – handing Korea a stunning and humiliating 6-2 defeat. A 7th place finish – Korea’s worst ever performance at the competition. Four years prior, they didn’t even manage to qualify. 1996. An Asian Cup to forget. Indeed, in Korea’s 10 appearances at the competition since last capturing the crown on home soil in 1960, the Taeguk Warriors have lost the final 4 times, and lost 3 semi-finals. In 2004, they were beaten by Iran again in a quarter-final 4-3 thriller. In 2007, they lost to Kuwait in the group stage before exiting to Iraq on penalties, scoring a measly 3 goals throughout the competition. 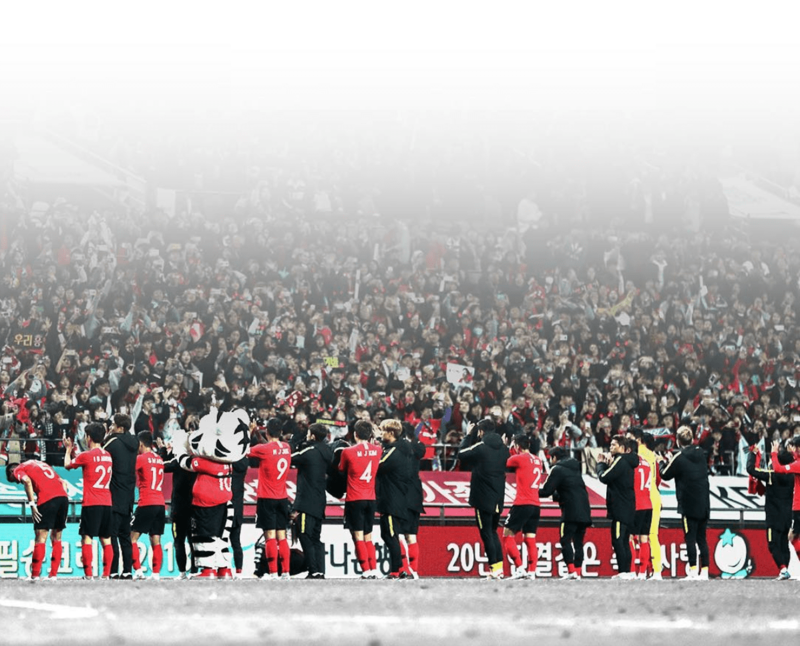 In 2011, they were controversially eliminated by Japan in the semi-finals, Koo Ja-cheol, Lee Yong-rae and Hong Jeong-ho having fired three successive blanks in the penalty shootout. And finally, in 2015, Kim Jin-su’s lapsus of judgement in extra time let James Troisi sink Korean hopes in a spectacular final in Sydney. Simply put, this has, historically, been a tournament of pain for Korea. But this year, one could be forgiven for setting sights a little higher. Momentum is firmly on Korea’s side with a group of players that either won gold at the Asian Games or defeated Germany at the tail-end of the World Cup, a manager whose first impressions have been thoroughly impressive, and an energized, re-invigorated, supportive fanbase that has once again found its voice and dare to dream. For the first time in a long while, the Korean National Team comes into this tournament as heavy favorites. With Iran missing key players, Australia lacking form, and Japan going through a redevelopment phase, Korea comes into UAE with a proven squad. Goalkeeper Jo Hyeon-woo should be the one to debut between the sticks, despite Kim Seung-gyu’s recent appearances. Jo needs no introduction after his performances in Russia just last summer. Upon securing the gold medal in the Asian Games and absolving himself of military duty, he’ll look to continue his footballing success and finally secure that eagerly awaited move to Europe, given he performs as well as he has been between the sticks. In defense Korea possesses the centre-back pairing of Kim Young-gwon and Kim Min-jae–instrumental figures in Korea’s run in the World Cup and Asian Games, respectively. Both technically and physically adept players, Kim Min-jae in particularly possessing the ability to pick out a player with a long ball, Korea has what seems like, for the first time in a long while, a defensive foundation the side can rely on. Add to that the welcome headache of Kim Jin-su’s return, arguably the side’s best fullback, and the team possesses three different options to play on the left and right – the other two options fresh off their World Cup experience. Korea has always been recognized for its midfield, and in this Asian Cup, our squad does not disappoint. Veterans Koo Ja-cheol and former captain Ki Sung-yueng look to appear for what will surely be their last tournament with Korea, and Lee Chung-yong makes a very, very welcome return after his fresh start in Germany, where he seems to be looking like his former self again. Alongside them comes the next generation of equally creative and promising midfielders in Hwang In-beom and Lee Jae-sung. The industrious Hwang Hee-chan has been called-up, and Lee Seung-woo makes an 11th hour surprise entry to the squad, coming in for Na Sang-ho, who has withdrawn due to injury. It’s a surprising call, but Lee Seung-woo has finally been beginning to make appearances for Hellas Verona; to call it undeserved would be cruel. It’s worth noting that each midfielder in the squad comes off Korea’s experience in either the World Cup or the Asian Games. Except Lee Seung-woo–who’s appeared in both tournaments, and Lee Chung-yong, who’s already appeared in two World Cups and Asian Cups. Korea’s glaring deficiency in forwards who can finish has perpetually been an issue with the side, but for the first time it seems that there are not one, but two options in Hwang Ui-jo and, of course, Son Heung-min. Hwang Ui-jo will be looking to continue his hot streak starting from his performances in the Asian Games, which has led to his deserved call-ups to the national side as well as his right to the starting XI. But, of course, the talk of the tournament will be Son Heung-min, who will actually be joining the side after the conclusion of the group stages. If the 2018 World Cup wasn’t a call for responsibility, this tournament certainly will be for Son, especially considering his white-hot streak for Spurs, which has led to a surreal return of 10 goals and 7 assists in 11 appearances. It’s hard not to get excited in Korea’s chances. Bento in his early tenure with our side has come away with some convincing performances – the most notable being Korea’s triumph over Uruguay in Seoul, and then the 4-0 thumping of Uzbekistan following afterwards. Since then, Bento hasn’t looked back; post-World Cup friendlies have seen Bento tinkering with our squad, and despite some unimpressive results, the most glaring one being the recent snore-fest of a friendly against Saudi Arabia, Korea has continued to develop as a quick, technical side–Hwang In-beom’s inclusion as a staple in our starting XI the greatest indicator of our development. 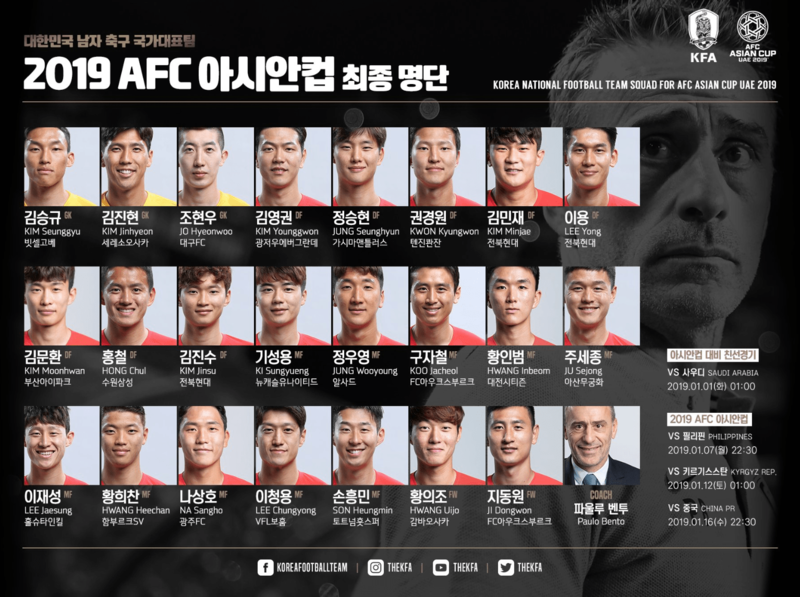 This is one of Korea’s most experienced senior sides going into the Asian Cup, and considering Bento’s early work with the side on top of the Asian Games triumph and our tempestuous World Cup run, there is a lot to look forward to with this Asian Cup. Bento will be looking for 3 points. No questions asked. With the expansion of the Asian Cup to 24 teams, there are a lot of new faces at this tournament. The Philippines, winners of Group F in the third round of Asian Cup qualifying, will be making their debut at a major intern ational tournament. The feeling in the Philippines is that the Azkals, the Street Hounds, will come with an underdog mentality looking to prove a point that the Philippines isn’t just a basketball nation. The squad is mainly made up of players from Ceres Negros, the reigning champions of the Philippines Football League, and their only real loss from the squad is Premier League goalkeeper Neil Etheridge electing to stay with Cardiff City during the tournament. A big talking point for the Azkals is how exactly Swedish manager Sven-Goran Eriksson will change the tactics after his appointment in mid-October. Sven led the Philippines to the semifinals of the AFF Suzuki Cup before falling to eventual champions Vietnam. If Sven is to improve the results for the Azkals, he’ll have to start tomorrow. They’ll line-up in a defensive 4-5-1 formation and try to frustrate Korea defensively before breaking on the counter. Captain Phil Younghusband, will be looking to create opportunities for Stephan Schrock and Iain Ramsay out wide or for Javier Patiño up top as the main creative outlet. It will be a test of resiliency for Korea. Bento seems to be prepared for the potential test, as it may be a game of classic offense v. defense, and Korea cannot afford to lose focus to be caught on the break. Perhaps a sign of things to come, but one thing is for absolutely certain. Korea will be going into this tournament as favorites for all the right reasons, and coming off of a wild year of international football, the Taeguk Warriors will be looking to start the Bento-era with an Asian Cup, dispelling a 59 year drought, and firmly placing itself on the top of Asian football. After all, considering our recent World Cup experience, anything is possible. A thank you to Kevin Estrada, football writer from @DugoutPH for his insight on the Philippines side. Does anyone know any live stream? Hi Sehyung, sorry we forgot to put the streaming website in this post. The official Korean broadcaster has a free stream, http://jtbc3foxsports.joins.com/. I also like bwintv and reddit soccer streams as well. Halftime, SK dominating possession so hard (78%, 87% accuracy vs like 53% for Phil), but squat to show for it. Not able to watch live stream, hearing of flubs, lack of touch & cool-headedness right in the final third, is it still rust? Sounds like a really crappy 1st half, making me long for Son. I’m cautiously optimistic that this will be Korea’s tournament. Korea will edge out Iran in the finals. You heard it here first!